First you’ll hear creaky wheels. The cart he drives is old and decrepit; it can be heard from miles away. Another warning of Ankou’s approach is a cold, bone-chilling blast of wind or a sudden, abrupt drop in temperature Breton Angel of Death. Ankou is a soul harvester; a Breton Angel of Death. When Ankou ventures out, he never returns home empty-handed. Although Ankou resembles the Grim Reaper, he is not an incarnation of Death. Instead Ankou is Death’s servant, who guides souls to the afterlife. He delivers souls to Death’s ferryman who transfers them to the Isle of the West. Ankou may travel alone or with two skeletons who are his footmen. When they are around, they do the heavy lifting and tossing of souls into the wagon while Ankou takes it easy and simply drives the wagon. Ankou stops at the house of someone who is about to die. Ankou knocks on the door, this sound is sometimes heard by the living, or it could give out a mournful wail like the Irish Banshee. Ankou has also been reported as an apparition entering the house, who takes away the dead who are then placed in the cart. The last person to die on New Year’s Eve, or the person who dies closest to New Year’s Eve, fills the one year, rotating position of the town or region’s Ankou. If you hear Ankou’s Cart, the thing to do is to hide, but if you encounter him, it’s crucial not to look him in the face which may cause instant death. MANIFESTATION: Ankou is a tall, haggard figure or skeleton with long white hair. He wears a black shroud, wooden shoes and a broad-brimmed black traveler’s hat. 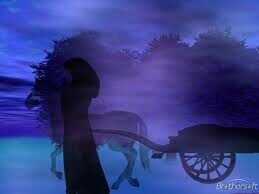 MOUNT: Ankou traditionally drives an old cart pulled by two or four black and/or grey horses. When the cart is pulled by two horses, one horse is cadaverous; the other horse is strong and healthy. TIME: The Yule season and especially New Year’s Eve, when people were traditionally advised to stay inside lest Ankou seize them. Ankou is particularly active whenever the Wild Hunt rides.